Only 15 minutes from Carentan, our bed & breakfast accommodation and holiday cottages are ideally located for exploring this historic town. Located in the La Manche department of Normandy, Carentan witnessed fierce fighting during the Normandy invasion in 1944. The road from Ivy House passes many historic areas on the way to Carentan, including Sainte Marie Du Mont. The town was of great strategic importance to the Allies as this was the vital link between Utah Beach and Omaha Beach. The town was occupied by the Germans and they were ordered to hold it at all costs. As depicted in the television series, Band of Brothers, there were elite German Paratroopers (Fallschirmjagers) stationed in and around the town; they proved to be strong opposition to the American’s pushing in land from Utah Beach. Dead Man’s Corner, a vital road intersection from Utah Beach to Carentan, also slowed the advance of the Americans. 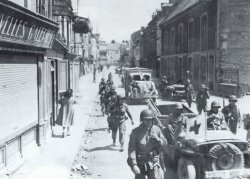 It was not until the 12th June 1944 until the American’s captured Carentan. Until that time, the hapless civilians would hide in their basements and other safe havens until the fighting ceased. It is now a peaceful market town; however, there are still a lot of monuments that pay homage to the brave men who liberated this area all those years ago. Situated between the sea and the marshes (marais), it is a haven for nature lovers and bird watching. 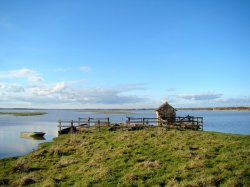 There are lots of fantastic walks where you can see migrating birds, seals and other animals dotted around the surrounding marsh land. La Maison du Parc is just 2 kilometres from Carentan and it is possible to take boat rides to discover these beautiful marshlands; perfect for bird watching holidays. The national parks of the Cotentin and Bessin areas will leave you with superb images of natural beauty and we certainly recommend a visit during your stay at Ivy House. Carentan is situated at the centre of the department of La Manche, at the border with the Calvados department. It is only 30km from Saint-Lo, 50km from Cherbourg, 30km from Bayeux and 65km from Caen. It is a vibrant and pleasant town that has all the services you might need: Post Office, pharmacy, supermarkets, banks, cinema, swimming pool and main line railway station. It is possible to take direct train services to Paris for those who might want to visit the capital. There are many accommodation options available for visiting Carentan. In and around the town, including Saint-Hilaire-Petitville, there are many B&B’s; however, for those who have their own transport, there are more rural properties that offer more space and access to historic sites. Ivy House is not too far away and we have the advantage of being located right behind the D-day Utah Beach. From our accommodation, it is just a short stroll to the beach, the bunkers and the D-day museum. If you are planning on taking a vacation in Carentan, please do not hesitate in contacting us. We would be very happy to welcome you to our historic home.